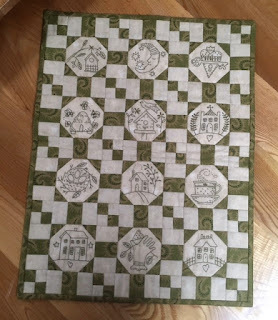 Quilting Adventures: Compassion with every stitch ...! Compassion with every stitch ...! The sun is shining, I am still breathing .... life is good! I have decided to place myself on a media diet and lock myself up in my happy place, quilting/stitching away .... ! 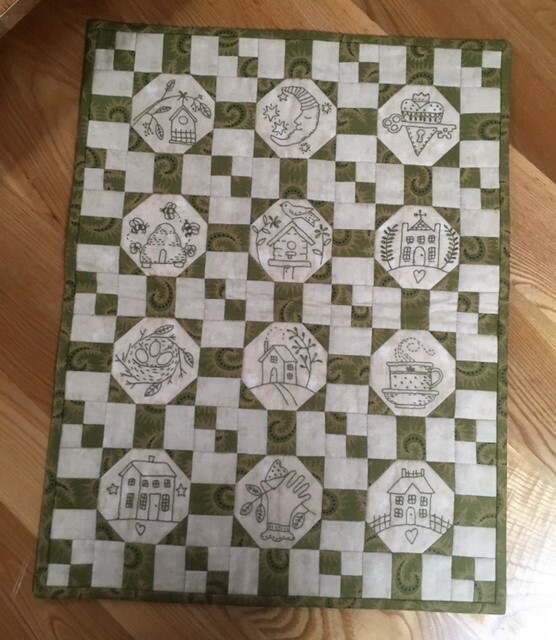 I managed to finish this cute little quilt called My Little Year by Kathy Schmitz, started in September 2016. And ... I completely finished, quilted and bound, My Little Home. If you recall, it was at a flimsy stage back in September 2016. I so enjoy working on these small projects! Each hand embroider block takes approximately 2.5 to 3 hours to stitch. As opposed to tracing each block, I use Transfer-eze. If you haven't read my recent post on this product, do so here. In order to not only save fabric but also make the cutting of the stitched block easier, I trace a square on a large piece of cotton fabric using an Omnigrid 3 1/2 inch square and Sewline Stayer Permanent Market - brown. I will then place the water soluble transfer on the fabric and stitch my block. I only place the transfer when I'm ready to stitch a block and keep all the other photocopied transfer with the pattern. This way, there's less of a chance that I'll lose a block. Yea, it's happened before ...! Thanks for stopping by. Enjoy your day! Cheers! Those are both beautiful and I do love Kathy's designs, I still have a few to do from her book. I also joined her one stitch club, a nice surprise each month to stitch up. Great idea. The stitching looks so nice and made up beautifully. That is an interesting method. Thanks for the tips. Both quilts are adorable! Love them. Wow! What talent! I love them both! The quilts are lovely-beautiful stitching. Do you use an interfacing behind the fabric when you stitch? Or are you very careful about how you finish the stitches on the back? Very clever -- thanks for the tip. Those little quilts are just so sweet! Jungle Fever .... Jungle Fever ..! Mother Nature .... the following day! Mother Nature on a Sunday ... !